"The shameful and humiiating defeat suffered by South East governors, Nnia Nwodo’s Ohaneze Ndigbo and other self proclaimed saboteurs, at the hands of IPOB as a result of the successful sit-at-home protest on the 14th of September 2018, will go down in history as the singular most memorable episode since after the war that returned leadership of the east back to the people. We must once again thank the people of Awka Ibom, Abia, Anambra, Bayesa, Cross River, Ebonyi, Enugu, Delta, Imo, Rivers and diaspora Biafrans for the unalloyed support showed to our leader Mazi Nnamdi Kanu and his parents and for the mandate given to IPOB to speak and liberate the Biafran people from this barbaric 'geographic expression' created by the British in 1914. We are proud of you and proud of the support and success we have achieved together so far. It is important to remind all government agencies, embassies, high commissions, United Nations, European Union, ECOWAS, African Union, governments of US, Israel, Britain, France, Russia, Australia, Canada, China etc, that any proposed discussions with South East governors/Ohaneze Ndigbo is an exercise in futility and a complete waste of time. Ohaneze Ndigbo leadership and South East governors have failed the people and have been legitimately stripped of every relevance. The people have spoken loud and clear on the September 14, 2018. 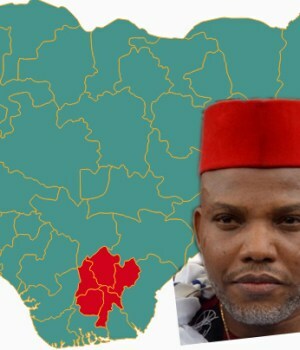 IPOB is now the authentic government of the indigenous populations of the east."